Bird watching is trophy hunting (not killing, obviously.) It’s a competitive sport although birders don’t talk about that. It usually involves taking pictures (with a tripod, telescopic lenses and a sore back), checking off lists, and identifying exotic migrants—assuming you can identify that pesky eye ring or count the stripes on its tail feathers as your bird takes off. In contrast, bird language is acquired close to home, no binoculars necessary, and is the ticket to the vast complex universe of the natural world. The best birders (who know at least a restaurant level of Bird) spot their subjects by listening first and then they site it. What they see is a bird doing something, not idly strumming his vocal chords while he takes in the scenery. Bird is the route to a deep understanding of the ways in which forest critters take account of one another as they conduct their everyday survival. 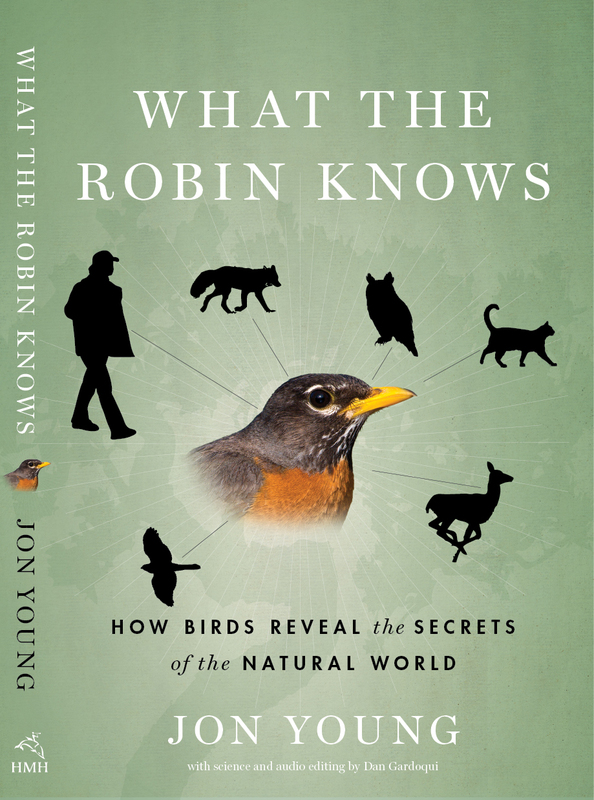 What the Robin Knows: How Birds Reveal the Secrets of the Natural World by Jon Young holds out the hope that ordinary people studying very ordinary birds in a small defined neighbourhood, perhaps focusing on an area as small as 50 yards across and 20 feet high, (the territory of a small bird) can pick up the most ancient of languages, one that was undoubtedly crucial to our survival as hunters and gatherers and possibly fundamental to the development of the human brain. Native Americans could spot advancing armies miles off by “bird plows”, a sudden sideways, and herd like exit from the bush of birds fleeing an unusual threat. Birds operate on a very lean energy budget; of course all critters do, but birds especially, which puts a premium on their calibrating exactly the right amount of effort necessary to achieve a given result. A quick get away can be costly, even if successful, as the bird may succumb to exhaustion in the end anyway. “Pell-mell flight might also put the flying sentinels in jeopardy of predators who have sized up the situation as a good wake-hunting opportunity and are moving in for the kill. Better to stay home and stay organized,” reasons Young. Birds don’t just fly away at the sight of a cat. They judge from its behaviour whether it’s stalking, or moseying home to its canned fish and a cushion, and they have calls to match. Birds have calls that distinguish among lowest of the low, the egg robbers, corvids, jays, raccoons, weasels, snakes, coyotes, wolves, and birds of prey, and whether these dangers are actually worth worrying about at any particular moment. These opportunistic interdependencies constitute a complex society. Birds will squirm around in anthills hoping to annoy the insects that will then release formic acid and drive the lice from their feathers. Magpies follow deer because they kick up the dirt exposing insects. And herding animals are great sources of ticks and a free ride. Red-tailed hawks hang around highways, travelling along with the vehicles taking advantage of their noise to disguise their own. Chickadees have some of the most complex alarm calls, matching the number of their “dee, dee, dees” to the level of threat, if sometimes straying from the truth. “Chickadees sometimes produce false alarms, causing the gullible to fly away and leave that much less competition for food. This behaviour indicated that the chickadees can make fine distinctions between fake and real alarms. Jon Young’s book is an impressive inspirational guide to getting to know the most common backyard species, and he claims you don’t need binos. By choosing what he calls a sit spot and recording what you hear, including truck noises, airplanes, slamming doors, barking dogs, sitting there quietly every day, preferably early in the morning so not too far from home, you will eventually, with help from audio guides and a few online lessons, understand the patterns of behaviour of individual birds in your sit spot universe. You’ve first got to figure out what the baseline, normal situation is, the dimensions of a given bird’s territory with its food sources, hiding places and vantage points. You’ll learn how to avoid taking deliberately quiet steps that could be interpreted as stalking behaviour, while also not causing unnecessary noise. If you find a nest, back off quietly so as not to attract the attention of predators. Sit with your back to the brush so you can hear anyone coming. We may not have any need to anticipate an advancing cavalry charge coming down our driveway, but learning Bird, however imperfectly, will attach us more to the natural world and that’s a good thing. Jon Young’s website, offers Bird Language Basics, a free email course, and DVDs. 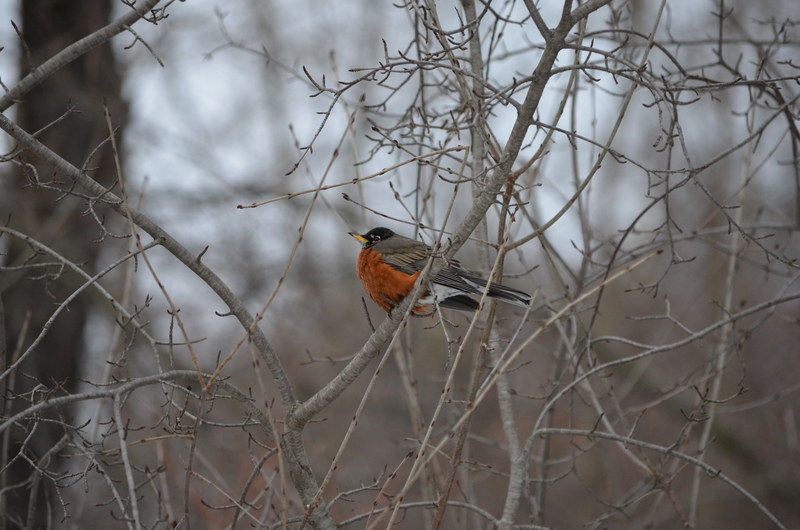 This entry was posted in Nature and tagged Bird Behaviour, Jon Young, Tracking, What the Robin Knows on February 12, 2014 by Penny Pepperell. This is a super post. Watching bird behaviour is more than entertaining. Great review and info.